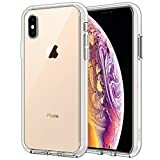 Last time the JETech Clear Case for Apple iPhone X dropped down to $3.99 on Amazon, we told you about it and it sold out within about an hour. Well, it’s back in stock so we’re telling you about it again. There’s a good chance that Amazon’s stock will sell out quickly just like it did last time though, so grab one or two while you can! There is some good news this time around though: Another seller has it listed at $4.99, so you’ll only have to pay an extra $1 once they do sell out.